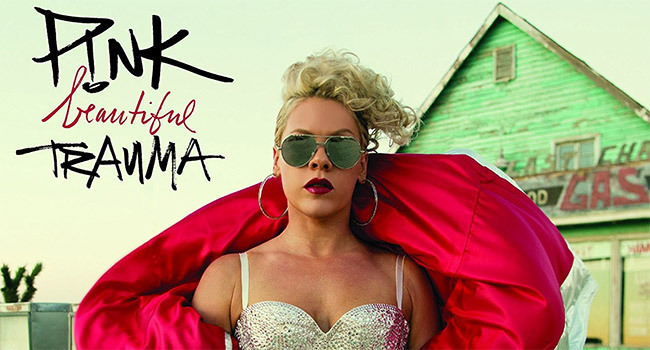 P!nk scores her second Billboard 200 No. 1 debut with her seventh studio album, Beautiful Trauma (RCA Records) and marks a career high for first week sales for the singer selling over 407,500 units in total activity. The album also debuts No. 1 on Billboard’s Top Album Sales Chart and Digital Albums Chart and is the highest selling debut for a female artist in 2017. Overseas, Beautiful Trauma debuts at No. 1 in ten additional markets including Australia, United Kingdom, Canada, France, New Zealand, Ireland, Belgium, Switzerland, Austria and the Netherlands and Top 5 in 14 markets. The album is certified double platinum in Australia, gold in New Zealand and is the biggest international debut of 2017 in the United Kingdom. In Ireland, P!nk is the first and only female to debut at No. 1 in 2017. P!NK kicked off promotion with a profile on CBS Sunday Morning followed by an appearance on The Tonight Show Starring Jimmy Fallon. She returned to the Saturday Night Live and Good Morning America to perform her hit single, “What About Us” and “Beautiful Trauma.” She capped off her television appearances on Watch What Happens Live With Andy Cohen. The first single, “What About Us” has over has over 150 million streams worldwide and is currently No. 1 on Billboard’s Dance Club Songs Chart, No. 2 at Adult Top 40 and according to Billboard is the eighth most played song in the country. P!NK will hit the road starting March 1st in Phoenix, AZ for her Beautiful Trauma World Tour 2018. Before tickets hit the general public, second shows were added in New York City, Boston, Washington DC, Houston, Toronto, Chicago, Oakland and Dallas.